Garcia prayed out loud as fellow travelers passed out from the heat. He was sweat-drenched and seething at his father, who had asked him to make the perilous journey, to relocate for the second time to a country where he would be labeled “alien” and face the barriers associated with having crossed, without a visa, the world’s most frequently-crossed international border. In his young mind, he was leaving an important position—he was student-body president of his rural Mexican high school. But he couldn’t have known that he would assume a much greater leadership role when he returned to the Chico area, where he had spent his early childhood. He couldn’t have known that 20 years into the future he would be known, nationally, as the undocumented attorney. In early 2014, Garcia became the state’s, and probably the nation’s, first undocumented immigrant to earn a law license after publicly disclosing his immigration status. His case was debated in the media and at the state Supreme Court, and ultimately inspired the passage of two new state laws. Today, at 38, he is a legal U.S. resident with a Chico civil law practice, a writer, an inspirational speaker, and by virtue of his experience, passion and political instincts, a figurehead for a generation of immigrants. They are young adults who were brought here illegally as children and are struggling with policies that have become increasingly inflexible and punitive during the past 20 years. Garcia appears weekly on a Spanish-language television show to discuss immigration issues. As a columnist for Spanish-language newspapers in this country, he writes about both the personal and political, about his mother’s influence and about how to respond to Donald Trump’s anti-Mexican commentary. But it is the “spirit of citizenship” that seems so elusive and unattainable to many of the unauthorized immigrants who grew up in this country and identify as American. They sometimes call themselves “Dreamers” because they long for a pathway to citizenship that, depending on their circumstances, may not exist, or if it does, may be very, very long. Take, for example, Garcia’s almost 21-year wait for a green card—the card that signifies legal residency and can be a first step toward citizenship. He received his green card on May 20, but his application had been approved in early 1995, when his father, then a legal resident and now an American citizen, sponsored young Sergio. Under the quota system in use, Mexican applicants who qualify often wait more than 20 years. Kevin Johnson, dean of the UC Davis School of Law, was one of the attorneys representing the State Bar’s Committee of Bar Examiners in its effort to admit and license Garcia. In 2011, the California Bar asked the state Supreme Court to rule on whether an undocumented immigrant who was otherwise qualified could be licensed to practice law without violating federal statutes. Garcia found himself at the center of a media blitz after the California Supreme Court announced in May 2012 that it would hear his case, which by then was being described as “landmark.” Garcia had a record of accomplishment: To put himself through school, he had recycled cans and authored a book on dating. He had volunteered his time, tutoring kids and teaching computer skills in Durham and helping to renovate the Biggs Grange Hall. He had passed the bar exam on his first try, which only about half of all test-takers can do. Journalists from around the United States and other countries were drawn to the story. Garcia said the arrival of journalists from China who came to Chico “bearing gifts” — an elegant mousepad and a mobile that hangs from a ceiling — surprised him most. It was during that period that he sometimes found threats or angry messages on his office answering machine, always left late at night. But if he also caught a part of the ”national imagination,” he did it with a frank willingness to tell a story that millions of people, who were part of a great modern migration, relate to. Garcia moves through a room with nervous energy, with the agile strength of someone who has performed outdoor work. During recent interviews, he wore dark glasses to protect his right eye in the aftermath of surgery to treat sun damage. He says he didn’t put on a pair of sunglasses until he was 30—even while he worked in almond orchards with his father, harvested walnuts to pay for schooling, and as a boy, tended cattle near his village of Panindicuaro in the western state of Michoacán. His story begins both there and here, with the connection between the Northern Sacramento Valley and northern Michoacán villages in central Mexico. For decades, immigrants from towns like San Antonio Carupo and Panindicuaro have come to the Chico area to harvest, pick, build and paint. In the beginning, they had visas; men were recruited to participate in the Bracero Program that brought guest workers to this country between 1942 and 1964. Garcia’s father, Salvador Covarrubias, crossed the U.S. border illegally in 1979 with his wife, toddler Sergio, and Sergio’s older brother to work near Chico. Crossing illegally is a desperate measure, Garcia says. About 1.6 million undocumented immigrants from Mexico live in California, according to Pew Research Center, and that number has been dropping. That’s in part because of record-high deportations, in part because fewer Mexicans have been attempting a border crossing that has become increasingly dangerous and difficult, in part because of economic growth in Mexico. Still, in a June press release, the U.S. Census Bureau announced that for the first time in its record-keeping, California’s Hispanic population slightly surpassed the white population in 2014, making Hispanics the largest single ethnic group in the state. In Chico, Garcia attended Chapman Elementary school, where he recalls feeling, in the early 1980s, like a “brown kid in a white world.” By 1986 — Garcia now had several younger siblings — his parents wanted to re-establish the family in their homeland. They returned to Panindicuaro, where all of them, except Covarrubias, would stay for eight years. Garcia’s father soon returned to Chico for farm-labor work; the checks he sent to his family kept them fed. Covarrubias also discovered a path out of his undocumented status through the amnesty program built into the Immigration Reform and Control Act (IRCA) that was signed into law by President Reagan in 1986. The legislation called for tougher immigration-law enforcement, but offered a pathway to citizenship for undocumented immigrants who had established a continuous work record in this country. There hasn’t been a major amnesty initiative since then or a successful effort by Congress to pass comprehensive reform.In 1994, Covarrubias insisted on bringing his family back to this area; they moved into a three-room shack in Nelson, almost 7 miles south of Durham, near his work. Garcia says he understands now that his father was thinking about the “bigger picture, the long term,” where his children would stand the best chance of escaping poverty. Garcia had little choice but to follow his parents. He graduated with honors from Durham High, but by then had realized that because of his undocumented status, he would be ineligible for university financial-aid packages. He received two degrees from Butte College and earned a paralegal certificate from Chico State as he moved closer to realizing a childhood dream—that of becoming an attorney who would pursue just causes on behalf of vulnerable communities. In 2009, he graduated from Cal Northern School of Law. The family’s story, although remarkable, would never have been told in these pages had Garcia not been the Central Valley man who persuaded the California Legislature to fast-track legislation that he needed. That law, making it possible for an unauthorized immigrant to practice law, has opened the door to other undocumented California residents studying law who will be able to practice their profession if they pass the bar exam. When he spoke recently at UCLA, Garcia noted that Latinos are under-represented in many fields. “We have become the largest group in California, yet that’s not reflected in college graduations, in political representation. It’s not reflected in places of power,” he told his audience. 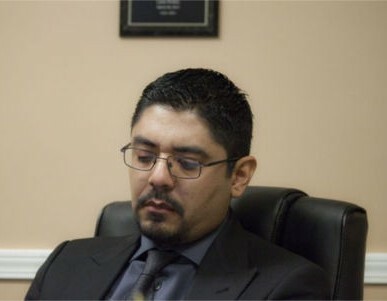 Garcia is seated at his desk during a recent interview in an office decorated with his framed law license and civil-rights awards; he’s maintained an office since 2008 when he began working independently as a paralegal. The nameplate on the door calls his practice, “The Law Offices of Sergio Garcia,” and although there’s only one law office, in typical Garcia fashion, he’s thinking ahead. He plans to open offices in larger cities. He specializes in personal injury and insurance cases, but sometimes assists clients with basic immigration matters. He tells me about his Durham High School math teacher, “Mr. Chris,” who told him that to study law, he had to master English. I mention that I’d like to speak to Mr. Chris, and Garcia picks up the phone and calls his former teacher, who has retired in Southern California. He tells Mr. Chris about his growing practice and his fiancée from Burbank. “I can finally come see you without worrying about la migra,” Garcia tells Mr. Chris in happy reference to his newly-acquired legal status. Garcia is surprisingly emotional sometimes, as if he’s telling a story for the first time. He fights tears when he recalls the terror and indignities he suffered during his 1994 border crossing. When Garcia balked at using an ID that wasn’t his, the coyote — an immigrant smuggler — pulled a gun on him. The border officials refused to accept the ID; the coyote then smuggled Garcia over in the truck bed. Three years later—not just because of Garcia but perhaps in part because of Garcia—many mainstream outlets almost exclusively use “undocumented” or “unauthorized” for immigrants who don’t have legal status. More journalists understand that “illegal” as an adjective or noun may be too sweeping to describe many of the 11 million people from a variety of countries who live in the United States and are working toward legal residency. Alejandra Miranda, for example, is a dental technician in the Central Valley town of Newman who qualified for the Obama Administration’s Deferred Action for Childhood Arrivals (DACA) program. It gives her protection from deportation and a work permit for two—year periods. Miranda met Garcia through a Facebook group and says she identified with his drive to succeed. With his help, all her siblings qualified, too. A lawsuit has so far blocked Obama Administration efforts to expand the DACA program. On Sept. 4, 2013, the state Supreme Court, which oversees attorney licensing, heard Garcia’s case. He had support from California State Attorney General Kamala Harris and the State Board of Bar Examiners, but his quest was opposed by the Obama Administration’s Department of Justice. DOJ said that unless the state passed legislation addressing the matter, the licensing would violate 1996 federal law excluding unauthorized immigrants from use of public resources. The court seemed inclined to that position and said it would render a decision in 90 days. By the end of the next week, Assembly Bill 1024, authored by Assemblywoman Lorena Gonzalez (D-San Diego), giving undocumented immigrants the right to practice law as long as they’re qualified, was sailing through the Legislature. Signed into law by Gov. Jerry Brown on Oct. 5, 2013, the bill allows them to work as sole practitioners or pro bono but doesn’t remove barriers to employment. In September of last year, another piece of legislation—Senate Bill 1159—was signed into law; it gives immigrants the right to professional licenses if they qualify, regardless of their immigration status. Immigration experts say Garcia’s case probably inspired that law, too, and is one of a several legislative changes shaping California immigration policy. The laws are a reflection of how much California politics have changed during the past 20 years and the extent to which Latino voters have become involved and influential in the political process, said Johnson, the UC Davis law school dean. One of the problems with federal immigration policy, Johnson said, is the relatively small number of work visas given for low-skilled workers. “Their labor is in demand, but there are very few ways for low-skilled workers to immigrate lawfully to this country. If you want to deal with legal avenues, this has to be considered. Garcia says he has a few things to do before he pursues his next goal—running for elected office, preferably the governorship—and time is short. He plans to marry soon, consolidate his law practice, and in five years when he’s eligible, become an American citizen. He has a scholarship foundation, the Sergio C. Garcia Foundation, and is only about halfway to his $100,000 goal. What would he do as governor? Unsurprisingly, his response emerges from his particular American-immigrant 20th-century experience. “I would want to make sure every Californian has respect and dignity and the ability to earn decent enough wages that they can take care of their family as long as they’re willing to work like everybody else,” he said.